Development of a beverage rich in bioactive compounds from blackberry, linseed and soybeans to evaluate the metabolism of the gut microbiota in an animal model. The human intestinal tract is populated by 1000-1150 species of bacteria, which constitute the microbiota, and can reach concentrations in a range of 107 to 1012 cells / g of intestinal content (Sanz et al., 2010). The decrease in the microbial diversity of the colon would be associated with different pathologies, such as inflammatory bowel disease, obesity, diabetes, hepatopathies and cardiometabolic complications (Chen et al., 2014). The main objective of this research work is the development of a beverage rich in bioactive compounds, beneficial for health, based on blackberry (as a source of ellagitannins), soy (provides isoflavones) and linseed (contribution of lignans), designed to adult consumers. 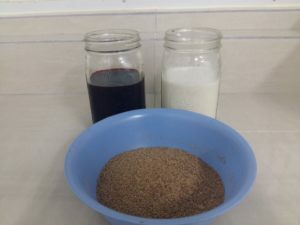 With this, it would be expected to implement an indirect and novel alternative method to evaluate the effect of the colonic microbiota on the metabolism of the phenolic compounds of interest, provided by the drink elaborated with blackberry, soybean and linseed. 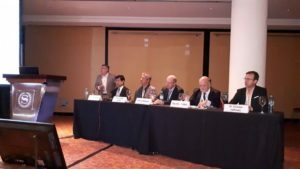 This project constitutes a first stage of a broader research on the issue of healthy aging, which seeks to elucidate whether the intestinal microbiota could be an explanatory factor of the longevity observed in certain regions of the country such as the Nicoya Peninsula. Develop a beverage rich in bioactive compounds from blackberry, linseed and soybeans to evaluate the metabolism of the gut microbiota in an animal model. To carry out a bibliographic review in the research topics: metabolites of the consumption of blackberry, linseed, soybeans; methods of analyzing the biomarkers of interest (urolithins A and B, equol, enterolactone, entorodiol); microbiota and effects on health; tools for product development; sensory evaluation techniques with consumers. Implement methods of chromatographic analysis of biomarkers associated with bioactive compounds of blackberry (ellagic acid, ellagitannins, urolitins A and B), soy (isoflavones, equol) and flaxseed (lignans, enterolactone, entorodiol). 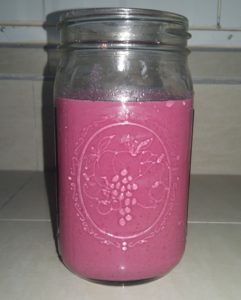 Develop a beverage based on blackberry, soy and flaxseed for a population of healthy adult consumers. Determine the product concept and the formulation of the most pleasing beverage for consumers through quantitative and qualitative sensory analysis techniques. To evaluate the metabolism of the gut microbiota by studying the profile of the urinary metabolites produced in a model with adult animals after the ingestion of the drink developed from blackberry, soybean and flaxseed, using a metabolomic analysis. Main: Dr. Ana Mercedes Pérez Carvajal, National Center for Food Science and Technology of the University of Costa Rica (CITA-UCR). Dr. Jessie Usaga Barrientos, National Center for Food Science and Technology of the University of Costa Rica (CITA-UCR). Lic. Carolina Cortés Herrera, National Center for Food Science and Technology of the University of Costa Rica (CITA-UCR). Dr. Buddy Soto Cairoli, School of Food Technology, University of Costa Rica. Dr. José Manuel Fallas Ramírez, Faculty of Pharmacy, University of Costa Rica. Dr. Fabrice Vaillant, CITA-UCR / CIRAD-PERSYST agreement. 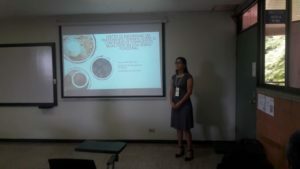 Tesiaria: there will be the collaboration of a student from the school of Food Engineering of the University of Costa Rica, who through this research would be developing their respective Graduation Thesis. The project will last for 2 years beginning in April 2016 and ending in March 2018. In the month of August of the 2017 a report of activities that have been carried out for the development of the project is presented, to know the report of click here. 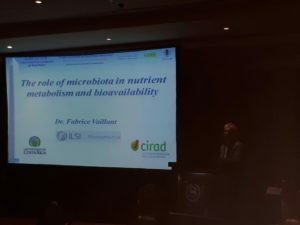 On Tuesday, October 10, 2017, professor and researcher Dr. Fabrice Vaillant, representing the entire project team, gave a presentation on “The role of the microbiota in the metabolism of nutrients and bioavailability”, this in the framework of the XXI International Congress of Nutrition (IUNS-ICN) held in Buenos Aires, Argentina. If you wish to review Dr. Vaillant’s presentation, you can click here. And to review all the other presentations of this session you can do it here. Functional drinks: perception and consumption in Costa Rican adults aged between 30 and 64 years. Effect of intensity of the heat treatment on the content of bioactive compounds in a functional beverage. The whole family of ILSI Mesoamerica congratulates Engineer Ana Irene for her successful defense and wishes her the greatest success in her future professional career.